Are You Ready For The 8-Week Bench for Reps Challenge? So I just got an update that Chandler Marchman’s Bench For Reps program is going to launch on Tuesday, January 8th. Will you be ready to take the challenge. Obviously in my last post I talked about the NFL Combine Bench. The 225 for reps is one of my favorite parts of the combine. However, it obviously favors the bigger guys. As you can see from the list of record holders, they are predominantly offensive and defensive lineman. That is because those two positions are the biggest guys on the field. Well don’t worry guys or girls. Even if you don’t weigh 300lbs you can take this challenge. The difference with this challenge is that is is bodyweight dependent. 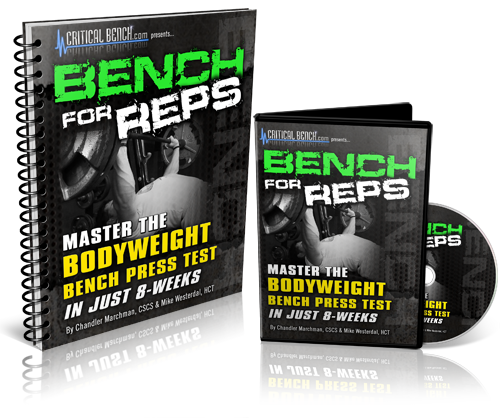 The Bench for Reps program is all about increase your ability to bench your bodyweight. 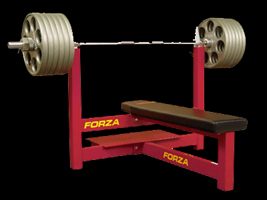 Obviously, when we first started lifting, the bodyweight bench press for a single was our first major goal. I know it was for me anyway. Now that you have been training awhile, being able to bench your bodyweight multiple times is the new challenge. 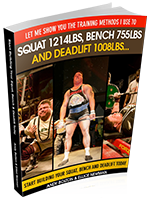 This an 8 week program to improve your bench press. Just think of how much muscle mass you can add if you double the amount of times you can bench your bodyweight. If you can only bench your bodyweight for a couple reps now, just think of what it would be like to bench they weight for 8 or even 10 reps. That is what this challenge is going to help you do, and I know I am looking forward to it. I should be getting a advanced copy of the program in the next few days, and I will be able to give you a sneak peak review of what to expect. Mark the dates on your calendar. It will launch Tuesday the 8th through Friday the 11th. After that it will still be for sale but the introductory price goes up. So you don’t want to miss out. The bench for reps program could be just what you need to bust out of your plateau and start the new year off right.